I’ve written about Radiant Heat many times on this site. While most of my past focus has been on new construction I wanted to share some great examples of how Radiant Heat can also be incorporated into remodeling projects. Before I get into that topic I first want to share my own personal experience with radiant heat. I’ve owned a home with in-floor radiant heat for almost 7 years now. I will tell you that radiant heat is one of the best investments we made in our new home as far as comfort and enjoyment. There’s not a winter morning that I get up and feel the warm floor beneath my feet that I’m not grateful. I enjoy it so much that if I ever build another home I’ll install radiant in every single room. Right now we have it on our first floor and all the upstairs bathrooms. I would chose to also include it in the bedrooms in the future. When it comes to new construction I use water based or hydronic radiant heating systems. However, when it comes to remodeling jobs, it’s never easy adding hydronic radiant heat to an existing boiler. It’s far easier and cheaper to add electric radiant heat especially if the room isn’t very large. Cost of Installation – on small jobs like bathroom remodels an electric system can be far cheaper to install. Ease of Installation – electric systems are installed above the structural floor system. Maintenance Free – electric systems have zero maintenance compared to water systems that require yearly maintenance. 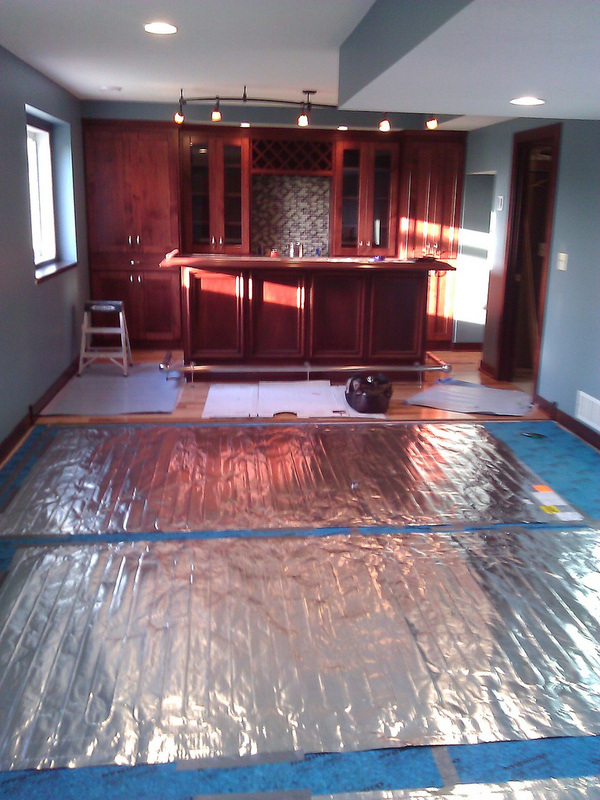 Faster Heat Transfer – Electric heat wires are installed much closer to the finished floor surface. Water systems can take hours to heat a room while electric systems can work in minutes. One of the best things about using electric radiant heat are all the options that are available. Take a look at a company like Warmly Yours, they offer a huge variety of electric radiant heat products. They have floor systems, driveway and walkway systems, and roof and gutter systems. The outdoor options are especially flexible when you consider there’s no water pipes in your yard that could freeze. The outdoor units are also VERY “smart” as they use electronic controls to determine when it’s actually snowing or icing instead of using electricity 24/7. If you’re a builder and you’re not offering electric radiant heat as an option it’s time you get up to speed on all the options available. If you’re a home owner be sure to ask you remodeler about radiant heating options for your new project. Never once have I regretted installing radiant. It’s so awesome. I regret not putting radiant floors in my home during construction. I kick myself every day about it… but I have one question. Is it possible to have a direct energy efficiency comparison to traditional forced air heat vs. radiant heat? If I had installed them, I could very well be kicking myself over the electric bill each month (which is already too damn high btw). Great question Miguel. Let me do a bit of research and see if I can find some answers. In most situations the electric will be used as supplemental, however, it still could make an impact on the heating costs. I often ask my customers what kind of heating i should install for them and a lot don’t no about radiant they just assume there is only one way of heating your home. I love radiant does the job its supposed to. I’ve actually had radiant heating installed a few years back. I can say it’s my best investment so far. The cost of electricity is through the roof in NH. So what about radiant forced hot water retrofit systems – Warmboard is one brand. There are others. I believe there are even wall systems available if the lowered height in a room is an issue. The installation and material cost are higher. In my opinion in the long run these systems will be a better investments where electricity cost are a major factor. What I have seen is an engineered underlayment with foil and foam layers and channels for piping. I learned the hard way during a job interveiw that cooling is another application possible with a radiant system.